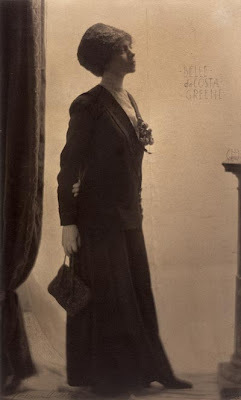 Belle Da Costa Greene, 1911. 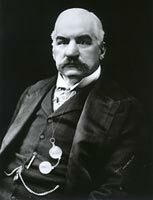 In the 1890s, financier J. Pierpont Morgan began building a collection of art, rare books, manuscripts, and artifacts that would surpass anything previously known in the United States. In 1902, he commissioned Charles McKim, the nation's most prominent architect, to build a library to house his treasures. There remained, however, the problem of organizing his grwoing acquisitions, which had until that time been stored in the basement of his Madison Avenue mansion. Enter his nephew, Junius, a student at Princeton and an aesthete much interested in art and books. Junius had made the acquaintance of a young librarian at Princeton, Belle Da Costa Greene, who was a knowledgeable cataloguer with a particular interest in old and rare books. He brought the young woman, then barely 20, to meet his formidable uncle on a fateful day in 1905. The senoir Morgan, impressed by the young woman's intelligence--and no doubt attracted by her beauty--hired her to put his collection in order. Belle accepted his offer, and spent the next three years cataloguing treasures that would make any librarian weak with envy. 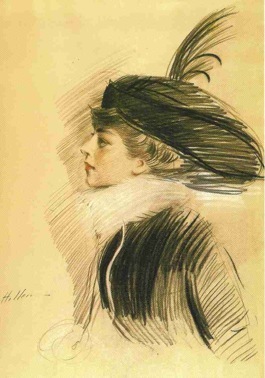 Portrait of Belle by Paul-Cesar Helleu. Bellle Da Costa Greene was very much a self-made woman. Raised in Washington, D.C., in an educated, middle class family, she had not attended college but hadreceived all of her library training on the job at Princeton University. She was, by all account, extremely intelligent, shrewd, vivacious, socially adept, independent, charming, and beautiful. She also had a secret: she was an African-American who was "passing" as white. Her father was Richard Greener, the first African-American to graduate from Harvard and the dean of the law school at Howard University. Greener and Belle's mother, Genevieve, has separated when she was a child. 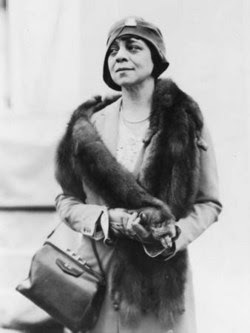 The very light-skinned Genevieve dropped the "r" from her prominent husband's last name and began to pass herself and her children as white, not because she was ashamed--she herself was a daughter of Washington's black bourgeoisie--but because she pragmatically realized they would have far more opportunities open to them if they were believed to be white. Belle added "Da Costa" to her name (her original middle name was Marion) and put it about that she was of Portuguese descent, accounting for her olive complexion and curly dark hair. By 1908, Belle had won Morgan's confidence in her knowledge and abilities, and he began sending her to Europe to purchase books, and especially illuminated manuscripts, for his collection. Belle became a major figure in the international art scene: already strikingly beautiful, she dressed fashionably, declaring famously, "Just because I am a librarian doesn't mean I have to dress like one." She sought to learn from prominent scholars, including Sidney Cockerell and Bernard Berenson, the latter of whom she counted mong her lovers. 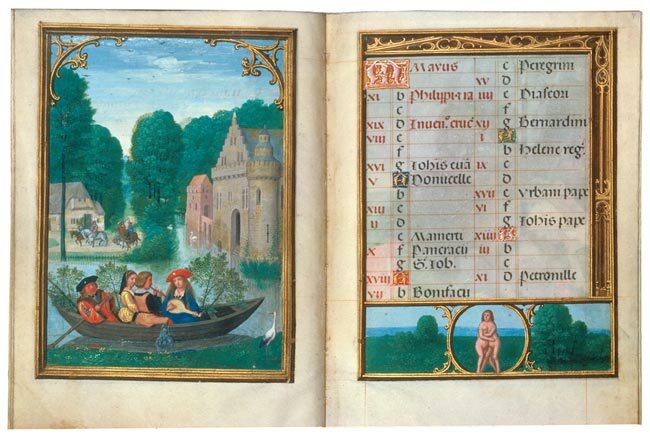 The Da Costa Hours. Image courtesy of the Morgan Library. When J. P. Morgan died in 1913, he left Belle $50,000--the equivalent of $800,000 in today's money--effectively making her financially independent for life. Fortunately his son, Jack, recognized Belle's worth to the Morgan collection and asked her to stay on and to continue acquiring treasures. 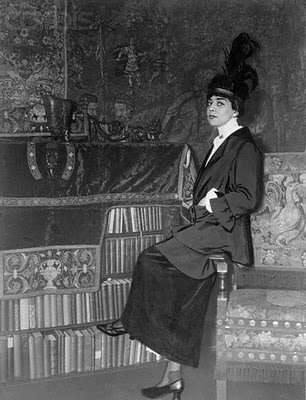 In 1924, Jack Morgan established the Morgan Library as a public reference library and art collection, and named Belle as its director. She held that position for the next 24 years, until her reitrement in 1948. Given the depth, breadth, and stature of the Morgan Collection, it is difficult to overstate Belle's influence on American art and antiquarian book world. Her acquisitions and stewardship continue to benefit us today, as seen in the recent manuscript exhibitions at the Morgan. She was not the only woman in a prominent position at the Morgan. Bookbinder Marguerite Duprez Lahey kept a much lower profile, but was responsible for the luxurious bindings and solander cases that housed many of Morgan's finest books and manuscripts. A friend of Belle Greene, she first began working for Morgan in 1911, and continued to do so, nearly excelusively for over 30 years. A graduate of Brooklyn and Adelphi College, she served a two-year apprenticeship in at New York's Old Chelsea Bindery and went on to study bookbinding with Paris masters, particularly Jules Domont. Little seems to be known of her life outside her work: She was fron Virginia, and a 1937 article in Time magazine describes her as "a slender blonde." It was noted with interest that she was left handed, often considered an impediment among artisans of her trade. Quietly toiling in her studio, she did all the work of binding herself, selecting an preparing the finest levant morocco, sewing the pages, pasting, mounting, pressing, tooling, and finishing the bindings. 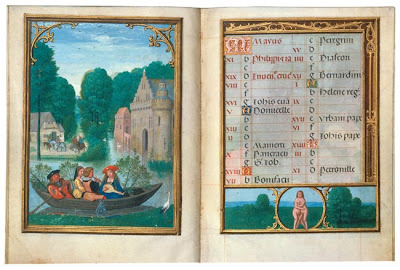 A 1937 exhibition at the Morgan showcased 150 of her creations for the library's manuscripts. At a time when few women worked outside the home, and far fewer attained professional prominence, Belle and Marguerite rose to the heights of their chosen fields, gaining the respect of their collegaues, competitors, and patrons. It is a pity so few know of them today. I was frankly appalled that I had never heard of Belle Da Costa Greene when I was in library school--talk about an inspiring role model. A recent biography, An Illuminated Life, will perhaps raise awareness of her story, I highly recommend it. How well Helleu captured so many women of the period in such a dashing way- wonderful that he captured Belle. This is a truly amazing story. Indeed an inspiring role model. I'm doing some research on Marguerite Duprez Lahey and was wondering, where did you get the information you mention here? I'm particularly curious as to her coming from Virginia and her introduction to Morgan through Belle.